Most of us have experienced a bad boss, and unfortunately, those experiences can create lasting effects. 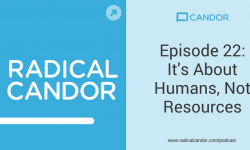 Here’s a story and question we got from a listener after she listened to the first episode of the Radical Candor podcast — it describes a common challenge that bosses have with balancing authority and Caring Personally and with building relationships with their direct reports. Just listened to the first episode and wanted to share several of my previous “horrible boss” experiences with you. I’ve been working about 13 years now. At my first real job out of college I worked at a newspaper in PA in the advertising department. The department head was an older man who I can now accurately describe as a misogynist. I was young and after one particularly hard experience (I can’t recall the details), I cried in his office. A year later, I was promoted from assistant to junior ad sales rep and while I was given the good news he also added something along the lines of “as long as there is no more crying.” Toward the end of my time there, an African American woman was hired in a position over him and he quit 2 months later. That’s when I really understood how the workplace can be for women. I moved to NYC 10 years ago and started working in the ad agency world. At one of my earlier jobs I had a particularly crazy female boss who has shaped me in ways I still need help recovering from. This boss was not much older than me, maybe 4 years. I was in my late twenties and she must have been early thirties. Her mood swings were incredible – one day she said hi in the morning and wanted to chat, other days she would ignore me for half of the day and then ask me to stay late working on projects with her that could have been done much earlier. She spoke harshly at times, but also praised me. Complete confusion. The worst experiences were when she wanted to talk about her personal life. On multiple occasions she would ask if I was busy, then pull me into conference room to tell me about her relationship problems with her boyfriend. There was cheating, there was verbal abuse, they got engaged and then she took the ring off and “didn’t want to talk about it”. In addition to the in person talking, she would IM me and talk about it. I never had any idea what to say or what she was looking for me to do. All I wanted to do was work so I could leave on time! This has had a lasting effect on me where I have a very hard time building relationships with the people I manage at work. I even had one employee tell me that she had a problem with it a few years back. I think I’m afraid of over-sharing and being thought of the way I thought of my old boss. How can I build a healthy relationship with my employees where we get to know each other and they respect my authority? This is incredible. THANK YOU so much for sharing. Wow – I feel really bad for 22-year-old Struggling and 25-year-old Struggling, but feel very happy for you, 35-year-old Struggling, because you will be a great boss having been shaped by seemingly incompetent bosses and because you’re self-aware enough to ask how to build these relationships the right way. 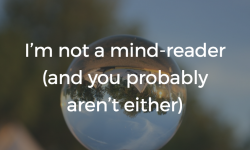 I have a couple thoughts, and interestingly some of my answers lie in your experiences. Let’s take your ad agency boss… What was it about her behavior that was so bad? Sharing inappropriate personal details? Maybe. Hot and cold communication? Meh. What she systematically did was put her needs ahead of yours. Every single example you gave, she put her own needs ahead of yours. 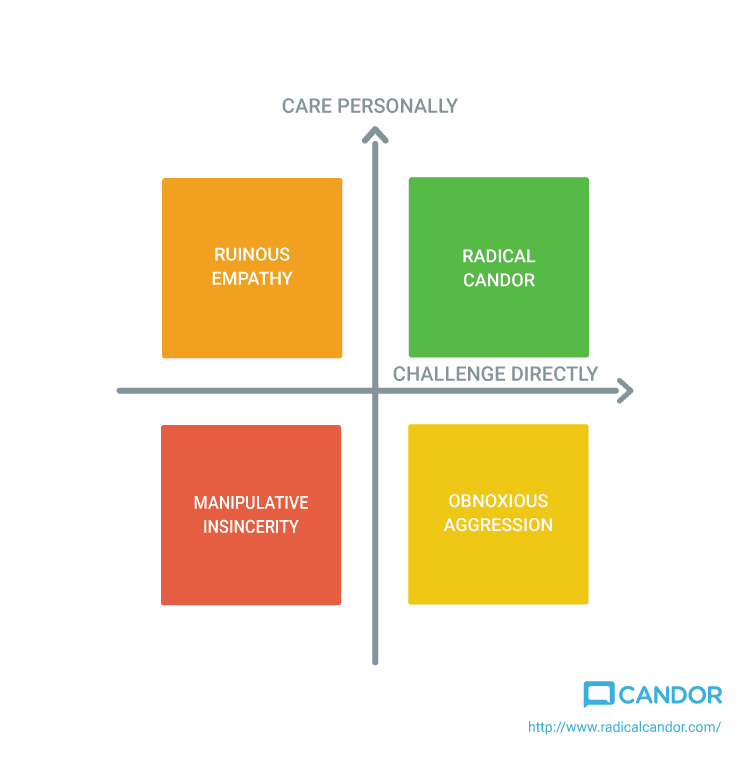 For my money, this is at the core of Care Personally, one of the two dimensions of Radical Candor. Caring Personally means demonstrating that you “give a damn” about the people you work with. Most people do care, but fall down simply because they fail to demonstrate it. Ad Agency Crazy-Person is different, though. She’s SELFISH. Caring Personally is about caring about others, about their needs and priorities. She was focused solely on her needs, her priorities. The first step to Caring Personally is deciding that your job is to enable the success of your team. Put their needs FIRST, above yours. How happy are are you right now? How productive were you this week? How can I help remove any blockers? 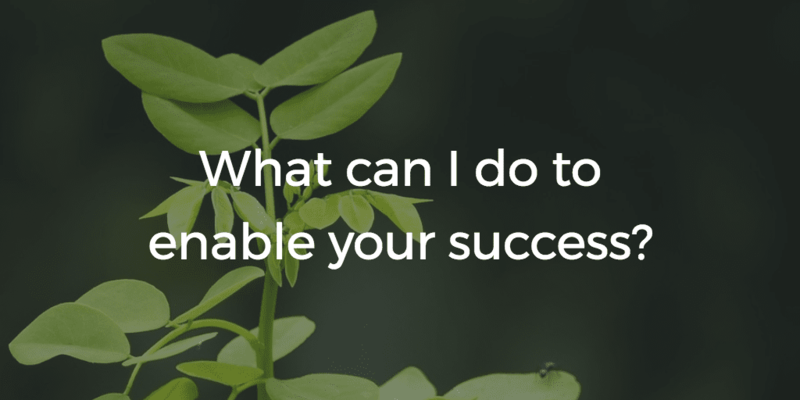 What else can I do to enable your success? What opportunities are we missing around here? Caring Personally, for my money, is about listening to people more than anything else. Of course, listen to their hopes, their fears, their dreams, but also listen to their ideas for improving the team, the work, the environment. All the answers are there on the team. You just have to ask. I will argue that by thinking about Caring Personally this way, you will ENHANCE your authority, not jeopardize it. It’s been my experience and not to put words in her mouth, but it’s been Kim’s, too. Your authority is absolutely not derived from your title or position. I promise you that. On paper, maybe, but in real life, no one on your team gives a hoot about your title. This was as true in the Marines as it was for Google. Authority was earned, not granted, and I’ve found in my career that it’s been earned far more by giving a damn about people than by knowing a lot of stuff or having a lot of ideas. Authority is earned, not granted, and I’ve found in my career that it’s been earned far more by giving a damn about people than by knowing a lot of stuff or having a lot of ideas. + 1 to everything Russ said! There is a huge difference between Caring Personally and Oversharing Personally!! I feel your pain on the crying thing too. I had a boss who said I absolutely could not cry in front of him, and that just ensured I cried all the damn time. It was terrible! I find it helpful to remind men who say stuff like that to me that 1) men cry too and 2) if you tell me I can’t cry, it just makes it more likely I’ll cry. Let’s come up with another way to help you cope with tears if they happen. I hope this is a helpful start.